James was born on the 13th December 1896 in Pendleton in Salford, Lancashire. He was baptised at Christ's Church in Salford on the 13th January 1897. He was named after his father and his mother was called Emily. He had 3 older siblings: William Alfred, Frederick and Emily, and 4 younger: Elsie, Harold, Hilda and Arthur. The family were members of the Wesleyan Church. James had been born at 16 Holroyd Place in Pendleton and the family still lived there in 1901. James senior worked as a joiner for a building firm. Ten years later they had moved to 34 Boardman Street in nearby Eccles. James junior had begun to work for a firm involved in the coal trade as an office boy. The First World War broke out in August 1914, and James joined the 2nd City Battalion on the 2nd September. The City Battalions were formed to allow men from the Manchester area to serve together. The 2nd City Battalion became the 17th Battalion of the Manchester Regiment and James was assigned to II Platoon in A Company. He was given the service number 8161. When he enlisted James was 5 feet 10 inches tall. He had a 'fair' complexion, grey eyes and brown hair. He trained with the 17th Battalion at Heaton Park in Manchester until April 1915, when they moved to Belton Park near Grantham in Lincolnshire. That September they moved to Larkhill in Wiltshire, and on the 8th November 1915 James sailed to France. 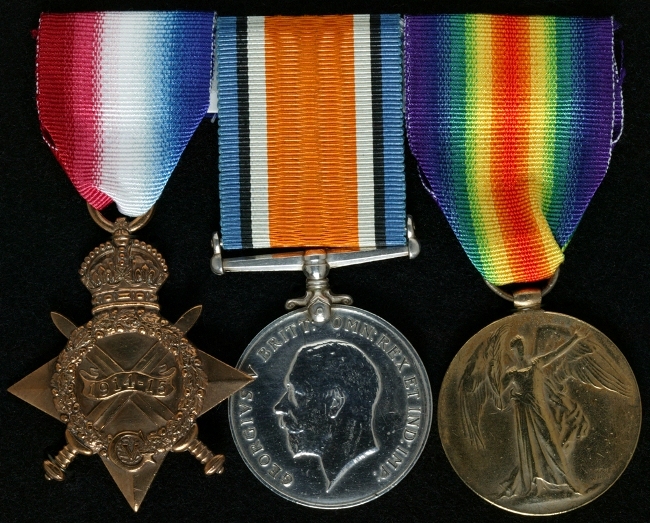 James served with the 17th Battalion throughout his time in France. They were based in the Couin area during 1915 then moved to Maricourt and Bray in the first half of 1916. During June they began training to take part in the Somme Offensive, and James will have taken part in the attack on Montauban on the 1st July that began this battle. By the 3rd over 350 of the 900 soldiers who had begun the attack were dead, wounded or missing. The 17th Battalion fought at Trones Wood on the 10th and Guillemont on the 30th. After a period of rest followed by service in the front lines they took part in the attack on the village of Flers on the 12th October. The rest of the year was spent in a quiet sector around Bellacourt. At some point during this fighting James was wounded. We don't know when, or how severe his injury was, although he was able to return to the 17th Battalion and serve with them in 1917. They fought at Cherisy on the 23rd April then moved north to Ypres in Belgium during May. The Passchendaele Offensive began on the 31st July and the 17th Battalion were again involved in the first day's attacks. They advanced towards Polygon Wood, but a combination of German fire and deep mud caused by heavy rain meant the advance was unsuccessful. James was wounded again during 1917, but we don't know when or where this occurred. His second wound was far more serious. He was shot through the left hand and his doctors were forced to amputate 4 of his fingers. There was no way James could continue as a soldier after this, so he was discharged as 'no longer physically fit for war service' on the 26th December. He was given a Silver War Badge, serial number 272264, to show that his discharge was honourable. Due to his injury James received a pension from the Army. In December 1922 this was assessed and confirmed. He was classed as 50% disabled, and would receive the pension for the rest of his life. At this time he lived as 14 Haddon Road in Peel Green, Manchester. We don't know anything about the rest of James' life. His brothers Fred and William also served in the Army; Fred was a Royal Engineer and William was a member of the Royal Flying Corps. Both of them survived uninjured.